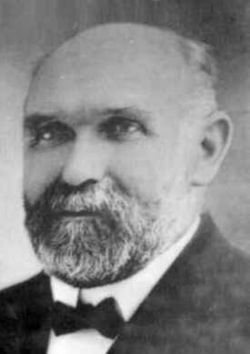 A General Conference Mennonite (GCM) minister and educator, Henry Ewert was born on 12 April 1855 at Nessau near Thorn, West Prussia. Henry was the oldest of 12 children born to Wilhelm and Anna Janz Ewert. In the spring of 1874 he migrated with his parents to Kansas, settling near Hillsboro. On 20 August 1882 he married Lizzie K. Baer of Summerfield, Illinois. After her death he married Mrs. Katie Kruse (nee Krehbiel) in 1926. Henry died on 29 December 1934, at the age of nearly 80 years, and was interred in Gretna, Manitoba. Ewert received his elementary and intermediate education in Thorn. In Kansas he attended the state normal school at Emporia from 1878-1879. Later he studied at the Des Moines Institute, Des Moines, Iowa, and took a two-year theology course at Marthasville, Missouri, USA. Soon after arriving in Kansas and obtaining the necessary preparation, Ewert taught school for a few years in his home district. In 1882 he became teacher and principal of a Mennonite parochial school at Alexanderwohl, Kansas. In 1883 this school, sponsored by the Kansas Mennonite Conference, was transferred to Halstead, Kansas, to be continued as a conference school under the name of Mennonite Seminary. Here H. H. Ewert continued to be teacher and principal for nine years (1883-1891). In 1884 he was ordained as conference minister and preached in different churches. He organized the Kansas Sunday School Convention. In 1891 H. H. Ewert came, upon invitation, to Manitoba, to take over the schoolwork among the Mennonites in the province. Here he was appointed school inspector of Mennonite schools by the government and engaged as teacher and principal of the newly established parochial Mennonite school at Gretna, Manitoba, which was at first named Gretna Normal School, then Mennonite Educational Institute, and later changed to Mennonite Collegiate Institute. He was active as teacher and principal for 43 years. H. H. Ewert was deeply interested in educational and religious matters. He would take an active role in church and conference undertakings among Mennonites in Manitoba and also at larger teachers' conventions, church conferences, and other benevolent organizations. He was the organizer of the General Conference of Mennonites in Canada. H. H. Ewert did not publish any books but wrote many articles for publication in Mennonite church papers, and some pamphlets. One pamphlet worth noting was the address given by him under the auspices of the Historical and Scientific Society of Manitoba in Winnipeg in 1932, on the topic, "The Mennonites." This pamphlet has been published in both English and German. He also edited a monthly German church paper, Der Mitarbeiter, for 28 years. Ewert, Benjamin. "Ewert, Henry H. (1855-1934)." Global Anabaptist Mennonite Encyclopedia Online. 1956. Web. 18 Apr 2019. http://gameo.org/index.php?title=Ewert,_Henry_H._(1855-1934)&oldid=112894. Ewert, Benjamin. (1956). Ewert, Henry H. (1855-1934). Global Anabaptist Mennonite Encyclopedia Online. Retrieved 18 April 2019, from http://gameo.org/index.php?title=Ewert,_Henry_H._(1855-1934)&oldid=112894. Adapted by permission of Herald Press, Harrisonburg, Virginia, from Mennonite Encyclopedia, Vol. 2, p. 275. All rights reserved. This page was last modified on 13 February 2014, at 06:39.